the PSFK conference that was held two fridays ago in new york was often characterized as a one-day get-together to talk about building better business models. while that may be true, i came away from the briskly-paced conference with a different reaction. the event’s unifying theme was far more substantial than that, as it was really about addressing the craving for lasting connection. if the conference had anything to do with crafting a better business, then it only did so by focusing some of its time on the subject of creating a better community for brands to exist within, which is fair enough. several ideas and speakers stood out. jonathan harris made a proposal for more creation and less curation and offered cowbird as an embodiment of those ideas; vikram gandhi‘s playful probing of spiritual quests brought a smile to my face; while robert kirkpatrick‘s proposal for data philanthropy might have had held most resonance for me. i was quite touched by kirkpatrick’s proposal for the private sector to help the public sector through sharing of their knowledge and data, which includes live data tracking, all of which he defined as data philanthropy. speaking on behalf of the united nations global pulse, he pointed out that there’s a mutual interest in this kind of exchange that can “unleash the power of big data.” i think that ideas like these are worth pursuing. vikram gandhi’s talk about kumare and eastern spirituality at first made me suspicious, but my skepticism quickly submitted to an appreciation of his sense of humor. kumare is both a persona and the subject of a documentary feature film that focuses on myth-building through the creation of a guru identity. the producers’ absurd yet empathetic approach to the project reminded me very much of writers such as jerzy kozinski and milan kundera’s take on life under communism, as well as filmmakers krzysztof kieślowski and roman polanski. “software engineers are becoming social engineers,” said jonathan harris during his presentation of cowbird, “we (therefore) need to consider the ethics of software design.” as harris went on to suggest that there should be a pledge for software engineers modeled on the hippocratic oath, i thought that these concerns apply to interaction designers as well. in this day and age, interaction design and software engineering is virtually interchangeable. prolific illustrator shantell martin‘s charming restraint provided a telling contrast to jason silva‘s bulimic brand of disruptive technology evangelism, which happens to borrow far too frequently from darren aronofsky’s pi. focusing more on original ideas would help mr. silva claim the rockstar mantle that he seeks. on the other hand, ms. martin’s playful sense of mischief lent her an aura of bona fides: she might be the real deal. parson’s new school of design‘s simon collins‘ mix of self-deprecation and unappealing arrogance ultimately obscured a really interesting presentation about the innovation in fashion design that’s coming out of the new york based design institution. collins’ boasts about the school’s achievements during the time of his employment brought more attention onto himself rather than to the students who may have blossomed under his stewardship. regardless of vision, any leader, whether a company president, a film director, or manager of a sports team, knows that the successful execution of an idea is ultimately dependent upon the efforts of its people in the field, and not the leadership from the sidelines. in contrast, outlier‘s abe burmeister‘s less spectacular matter of fact presentation, coupled with a wry delivery, framed a rather straight-forward case study of his menswear start-up’s success that increased the credibility of both his brand and his reputation. another start-up retail store success was narrated by cube venture‘s rachel schechtman, describing her latest project, story (a play on the word ‘store’ vis-a-vis “transactional storytelling”). it reminded me of what kiosk is already doing on spring street in new york, though story‘s interpretation is far more outward facing and better positioned, which will probably serve them well. 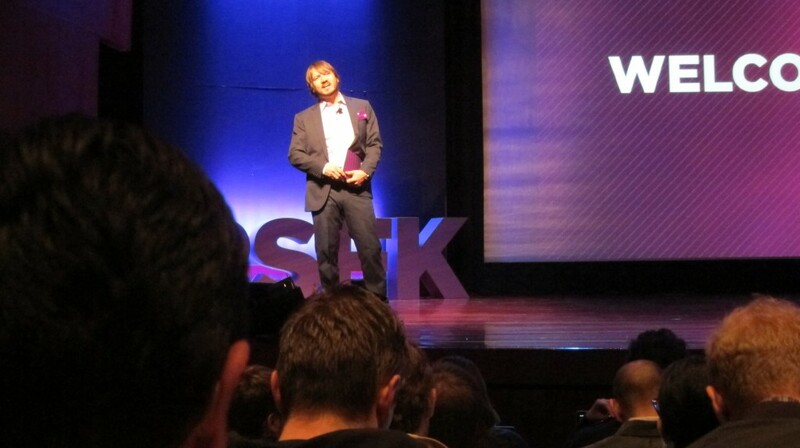 that’s a nice way to remember the PSFK conference (which, of course, was only brought to life by a lot of hard work and careful planning): there were one or two duds (hello jon harris and andrew allen, love your app and your storytelling but your twee penn & teller stage schtick? not so much; and steve powers, file under “stage hog”) but there were far more delights, which kept me quite pleasantly surprised.